Sign up and receive Property Email Alerts of Houses for sale in Valmary Park, Durbanville. The house of Magnolia as she's known to her owners, neighbours and international visitors who have enjoyed many formal dinners, cocktail parties and summer barbeques offer the perfect fusion of striking modern architectural design and unique interior design. French Bohemian, images of fire and Ice and a warm ambiance of glitz and glamour yet tranquil and quiet, welcomes you as you enter the front door of this magnificent property situated in the luscious established and certainly one of Cape Town's most prestigious northern suburban areas known as Valmary Park. As you enter this beautiful home the breath-taking double volume corner window takes you upstairs to a private guest suite, with own en-suite bathroom, home office and workroom that was originally designed as home cinema room. A formal lounge, dining room, family room, cigar lounge and bar chiselled out of solid Imbuia welcomes you as you enter from the foyer. All living areas with its unique flair creates a separate yet open plan feel that merges indoor and outdoor living. Large glass doors seamlessly integrate the spacious living areas with the deep set external covered patio. This together with a well-established garden and pool area, is ideally suited to cater for functions throughout our African seasons. Three downstairs bedrooms, each with their own en-suite, are cleverly nestled away from the living areas to ensure private and tranquil rooms leading out to courtyards, patios and garden. The home offers a gourmet kitchen with a gas stove and oven facilities and leads to an intimate covered patio with built in facilities to entertain guests to a traditional South African braai. The 2nd service and preparation kitchen is fully equipped and offers a walk-in pantry. The efficient layout is ideally suited to handle those big VIP dinners. Staff quarters are located for easy access to the service kitchen.The luxurious home offers several features such as: Central music system, under floor heating through-out a central vacuum system, alarm, heated pool, automated irrigation, outside perimeter beams, day and night lights all round, 3 phase electricity and electric fencing (partially) surveillance cameras and intercom system 2 water tanks, to name a few. Direct access from the 3 bay garage that can host four vehicles in tandem if need be. All Roman blinds, curtains exclusively custom made for this home are also included. View by appointment only. 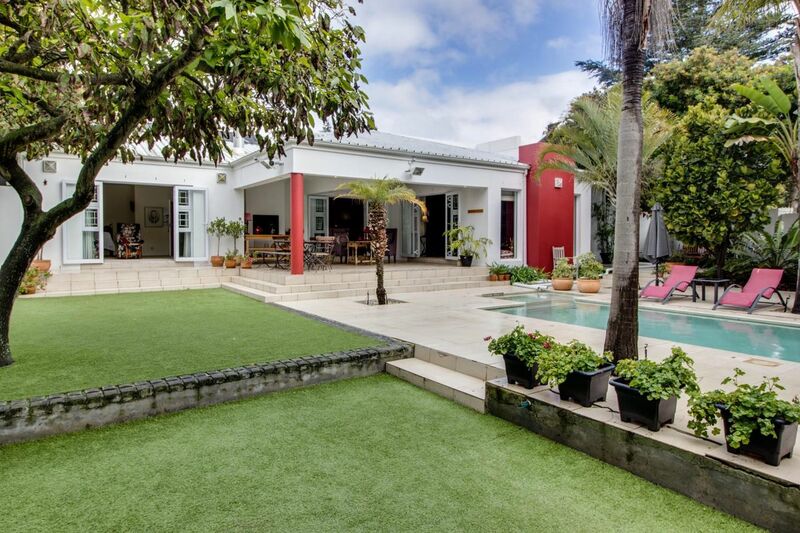 Sign-up and receive Property Email Alerts of Houses for sale in Valmary Park, Durbanville.